Welcome to Chip on a Stick! If you are looking to start up a new business or expand your existing one with a potential gross mark up of 800% Chip on a Stick™ could be the ideal opportunity for you. Chip on a Stick™ is an exciting concept and gives a clever twist to the humble potato. Chip on a Stick™ is sure to be a crowd puller, it looks great,and it’s a fun product that will be loved by children and adults. For over 150 years the British public have been enjoying chips and potatoes cooked in a variety of ways and they still remain as popular as ever! As the name suggests it is a Chip on a Stick™ you take a whole potato, no peeling required, use one of our skewers and wind it through the Chip on a Stick™ machine and after a few seconds you have your Chip on a Stick™ ready for frying. 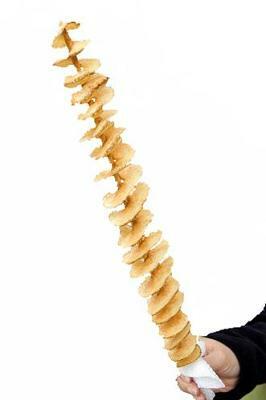 After a few minutes of frying you coat the Chip on a Stick™ with the customer’s desired flavouring. Then you start the next one! 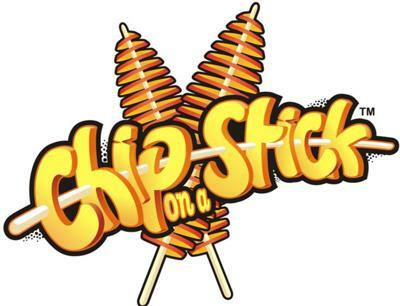 Chip on a Stick™ is currently sold at shows, events, chip shops and other fast food outlets. Why not join the successful team today.